The Entertainment Expo is the largest convention for video game and electronic entertainment industries. 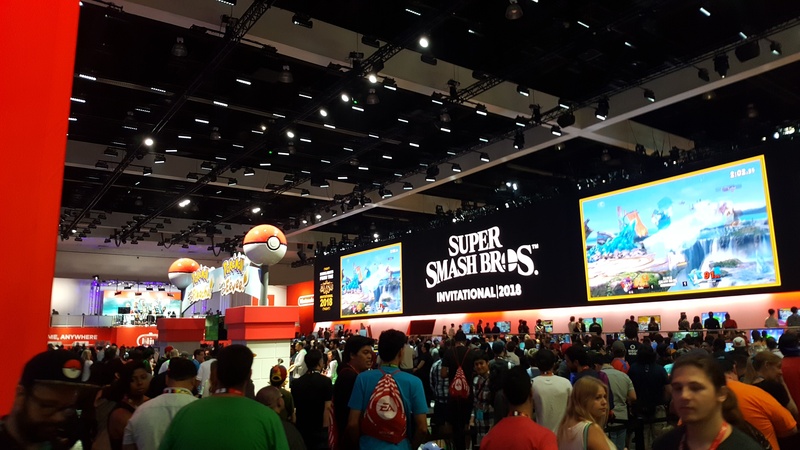 Hundreds of companies come to the Los Angeles Convention Center to show off the their latest and greatest to the masses. I got the chance to travel to LA and see what everyone had to offer. The Convention was set up in two halls: The South and West Hall. I first went to the West Hall. The booths included: Square Enix, Sega, Nintendo and Sony Playstation. Each Booth houses new games that are in the demo phase and are scheduled to be released soon. Players gather to try a portion of the game before it's release. The Playstation booth was my favorite, probably because I've been a Playstation fan for most of my life. I was really excited to try the new Spider Man game. It's set a few years after Peter Parker becomes Spider Man, so he has grown used to his powers and responsibility as protector of the people. The combat system was my favorite part of the demo. Spider Man is a very fluid super hero, and his moves felt lighting fast. A new feature that I have not seen in a Spider Man game is that each suit has a special ability. The one I used enabled me to spray a web to cover all surrounding enemies, allowing for easy knockouts. I ended the 15-minute demo with a boss fight in a bank against a villain who used high powered gantlets that allowed him to charge up and release powerful beams of what appeared to be electricity. After a few deaths figuring out his attack patterns, I ended the fight with a button mashing combo that caused a pillar to fall from above and knock out the villain. The screen faded to black and I was treated to at "Thank you for playing the demo" screen. I really enjoyed playing as one of my favorite super heroes. Playing the game brought back nostalgia as I haven't played a good Spider Man game since Ultimate Spider Man on the Playstation 2. My next trip was to the Nintendo booth. Most of it was set up to host tournaments for their new Smash game: Super Smash Bros. Ultimate. 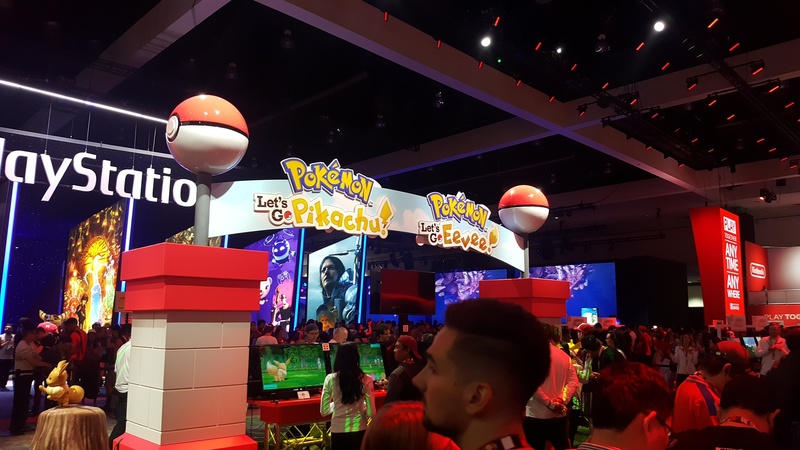 They also had a big section set up for their new Pokemon games: Let's Go Pickachu! and Let's Go Eevee! I did not get a chance to play the games, but I did watch a few trailers they had playing for people waiting in line. Based off the trailers, they look like adventure companion games to the widely popular game Pokemon Go! I learned that you can transfer Pokemon between your phone and your Nintendo Switch. After the Nintendo booth, I was pretty tired of waiting in lines, so I checked out the West Hall to see what other booths were set up. They set up a bunch of small booths to allow other industries to promote and sell their wares. One of the more interesting booths was the Motion Capture Animation booth, where they had an actor set up with a suit that was following her movements and replicating them with a character that was on a screen. 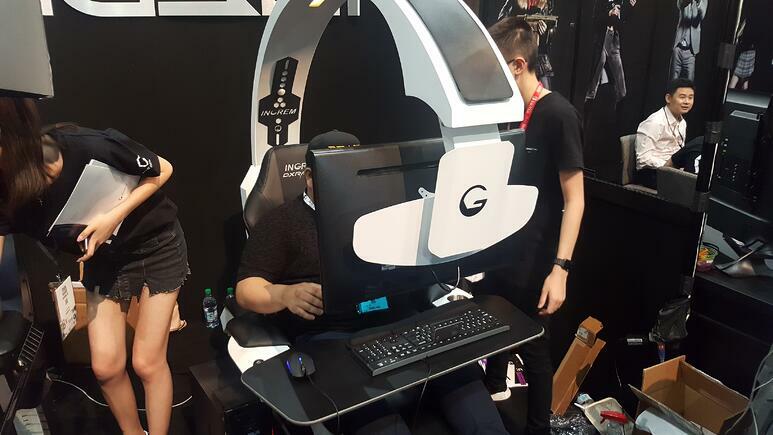 I chatted a bit with the guy running the booth and asked a few questions about how it works and and what animation programs were compatible with with theirs. I told him was as in college for motion capture animation, and I managed to obtain a business card from him. He directed me to a group on Facebook that is full of motion capture artists and animators, and told me that it was a good starting place when looking for a job or internship. On the second day, I headed over to the South Hall. 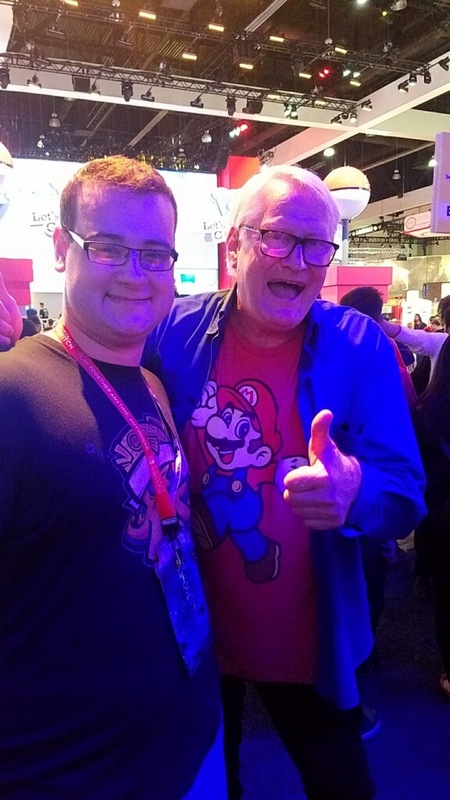 On the way, I ran into Charles Martinet, the voice actor for Mario and many other iconic Nintendo characters. I had never really met a video game voice actor before, so I was ecstatic that I got to take a picture with him. He was too busy to talk, or I would have asked him a million questions. Then I continued on my way to the South Hall. This hall housed the Ubisoft, Square Enix, Bethesda, Bandia Namco and the Focus Entertainment booths. 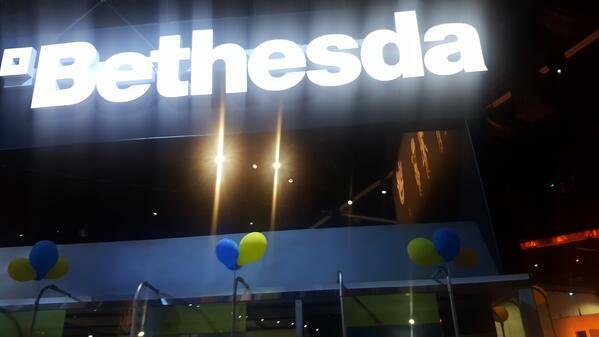 I first headed to the Bethesda booth. Their booth was jammed packed as they had just announced the trailer for their new Fallout game, Fallout 76. There was a huge line to get in what looked like a replica Fallout Vault shelter from the game series. They also had a ginormous demon statue to celebrate the release of Doom Eternal. Unfortunately, there were no demos of Doom or Fallout to try but there were some cool replicas from the Fallout series such as the T-51B Power Armor helmet. 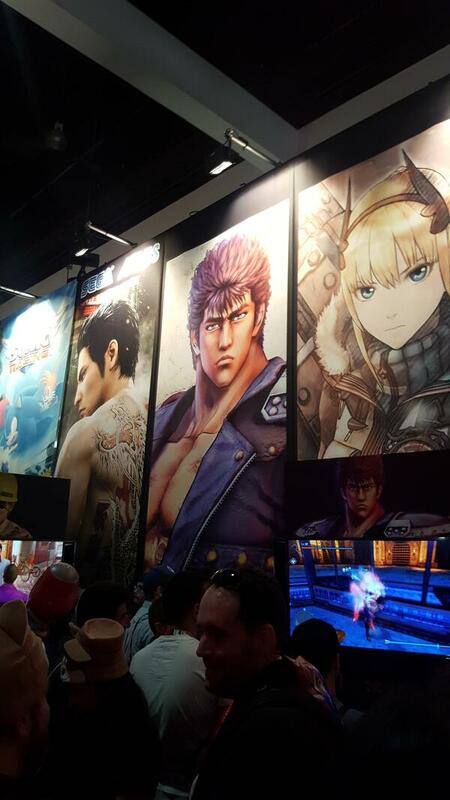 After exploring what Bethesda had to offer, I headed to the Sega booth to check out the new Fist of the North Star game. Being a Jojo's Bizarre Adventure fan, I was excited to see where Jojo got its inspiration from. The game is as gruesome and gory as the anime! The Sega booth also hosted a Sonic racing game that I did not get to play. I, however, did get to play a Xcom-style, turn-based World War II game called Valkyria Chronicles 4. It was actually pretty fun as I typically enjoy a solid strategic, turn-based combat system, and the graphics were really beautiful. The Sega booth was the last stop for the second day. On the third day, I went back and forth to each hall and did some of the things that I missed the previous days. I bought a video game mystery crate that had a variety of different merchandise across a couple dozen video game series. I tried to market myself to a few indie game developers and networked with a few industry people. I had a blast seeing the sights and testing out new games and gear. I got to market myself to a few indie companies as well, so there may be a chance that this vacation may turn into an internship. I am always excited to see the latest and greatest. This year's E3 trip makes me excited for whats in store next year! 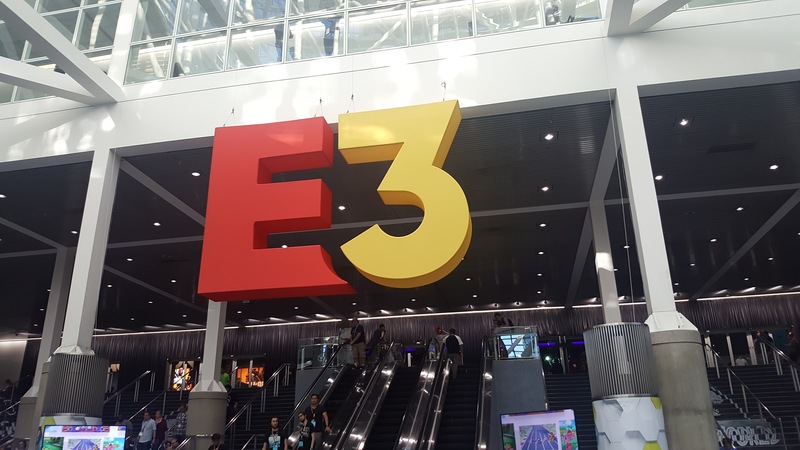 Have you ever been to E3 or some sort of convention? What did you learn? What was your favorite part?